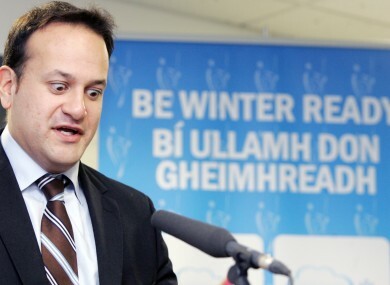 Transport Minister Leo Varadkar conveyed the strong words from the Troika partners in an interview last night. THE TROIKA WARNED the Irish government that unless it paid back over €1 billion due to bondholders in Anglo Irish Bank this week “a bomb will go off in Dublin”, according to Transport Minister Leo Varadkar. Varadkar used the terms in an interview with The Week in Politics on RTÉ television last night. He claimed that the government was warned by the Troika – European Commission, European Central Bank, and International Monetary Fund – of dire consequences if it failed to pay back €1.25 billion due to bondholders in the now defunct bank. Varadkar said it would lead to higher borrowing costs for banks and semi-State companies which would have a knock-on effect on household bills such as electricity and gas as well as for people on variable mortgage rates. Also speaking on the programme, Sinn Féin’s deputy leader Mary Lou McDonald argued this was not the case claiming that “the IMF has always taken a different position than the ECB” on the issue of paying back bondholders. Such positions became apparent at the Troika’s press conference in Dublin last week where the IMF’s mission director to Ireland Craig Beaumont said he had no objection to the government enforcing losses on the senior unsecured bondholders in the banks. In contrast the European Central Bank’s Klaus Masuch expressed reservations about such a move indicating it would cause a financial panic that could “spill over” to other countries. Email “Troika warned 'a bomb will go off' in Dublin unless bondholders repaid”. Feedback on “Troika warned 'a bomb will go off' in Dublin unless bondholders repaid”.